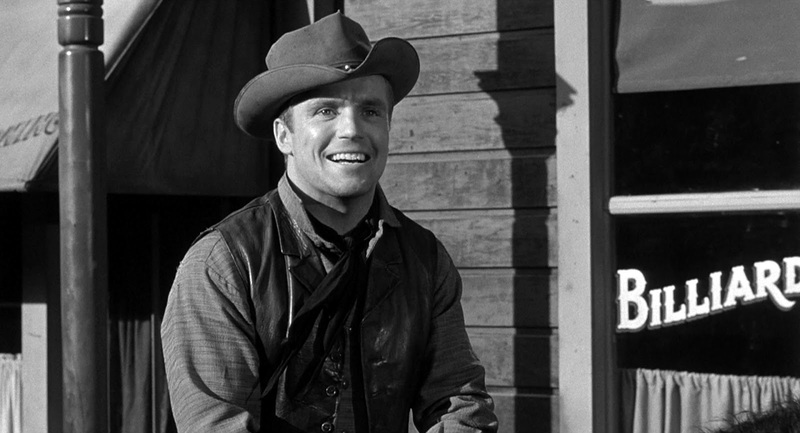 As lean and spare in its dramatic setup as it is grandiose in its majestic Jackson Hole setting, Jubal is a neo-noirish take on Othello, with Ford's title character playing both observer and inciter to the sexual melodramatics in an isolated ranch owned by the gregarious Shep Horgan (Ernest Borgnine). Horgan's lusty wife Mae (Valerie French) takes a shine to Jubal after he joins on. Jubal is smart enough to fend off the boss's wife's advances, especially after Shep makes him his foreman. Being skipped over for the job doesn't sit well with the ranch's Iago, Pinky (a very Method-y Rod Steiger) who starts planting seeds of jealousy in the trusting boss to drive a wedge between Shep and Jubal. What I find so fascinating is how easily Daves (Dark Passage)—who started out as a screenwriter and took his own pass at all the scripts for his films—adapts a noir template for Jubal. Despite a light backstory for Jubal Troop—mainly explained in a throwaway scene between Ford and love interest Felicia Farr (playing Naomi, essentially a Mormon settler)—the character basically arrives fully formed out of nowhere. Physically injured, and maybe even in a state of delirium approximating a sort of deliberate amnesia, Ford's Jubal is a kind of everyman cowboy who only seems to exist when he's in the frame in much the same way Clint Eastwood's Man with No Name does in Sergio Leone's spaghetti oaters. Jubal seems to breathe only in the expansive pocket that is the valley at the foot of the Teton Range and not much further. Coupled with the dark shadows dominating each impeccable frame and the vampish femme fatale played by the fetching French, this existentialism serves to give the impression of Jubal's hero as a good but increasingly desperate man with no way out. Throw in tough guys like Borgnine, Steiger, and even Jack Elam and Charles Bronson and you've got a movie which could just as easily take place in the grimy streets of the underworld. Fortunately for us, the lush color and outsized landscape perfectly suit the rangy mythmaking associated with westerns. As soon as the story proper is over "The End" is emblazoned on the screen, even before the mysterious Jubal has a chance to gallop off into the sunset with his new love Naomi. 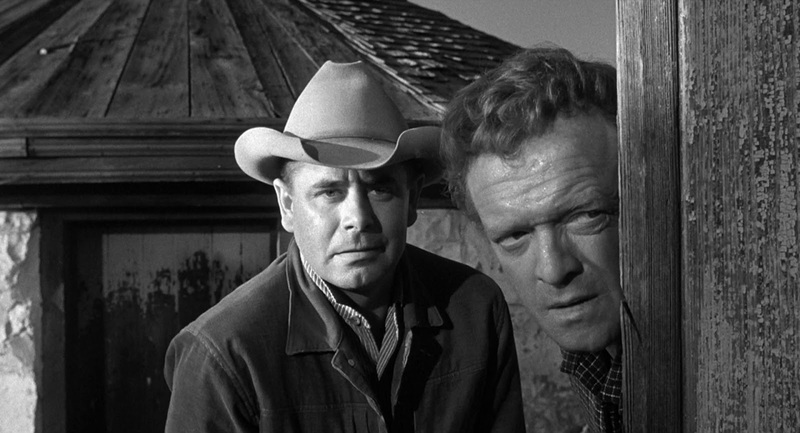 Shot in black-and-white, starring Van Heflin (Act of Violence), and predicated on a ticking clock element, 3:10 to Yuma certainly has its own noir elements. 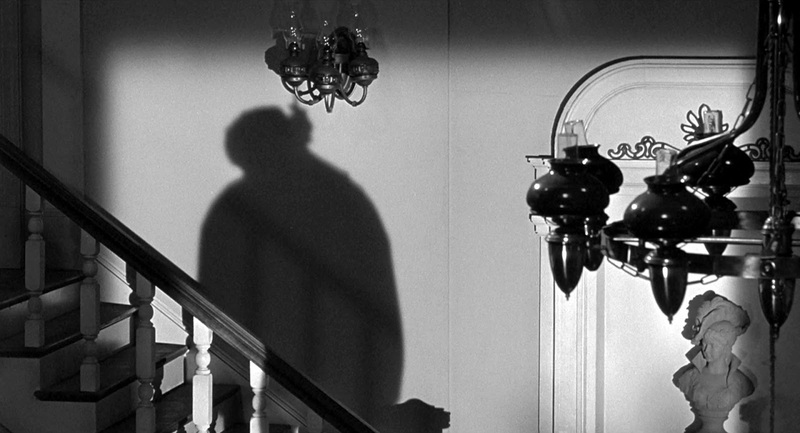 The sharp contrast between dark and light in the cinematography is an obvious expressionistic effect we associate with noir, of course. But here it is used less to touch every character with a bit of corruption and more to delineate the purely good—Alice (Leora Dana), wife of rancher Dan Evans (Heflin)—from the purely evil—psychotic Charlie Prince (Richard Jaeckel, above), henchman to outlaw Ben Wade (Glenn Ford). Most of the other characters traffic somewhere in the middle. Evans is not as altruistic as he appears in taking on the assignment to deliver Wade to the 3:10 train leaving Contention City; he only agrees to it when the pay is sufficient to save his struggling ranch. And Wade is not as bad as he appears to be, showing kindness towards forgotten women like Alice and barkeep Emmy (Felicia Farr, again). In fact, Wade and Evans are two sides of the same coin, each easily imagining living the other man's life, envying him, and perhaps outright resenting he never had that opportunity. There are some stunning displays of cruelty, particularly in the way the town drunk (Henry Jones)—newly deputized and looking for redemption—is dispatched. His execution is made all the more disturbing because he is the only man willing to help Evans against the ever escalating opposition. But it's these moments of darkness that make the lighter ones, like glimpses of Evans' home life, stand out all the brighter. Less morally complex than Jubal, but ultimately more fluid, 3:10 to Yuma is a mean little western gem that again demonstrates Daves' unsung auteurial strengths as well as the true dynamism of Ford's low-key acting. Fine write-up to great pair of Delmer Daves films, Tony. Well done. The 3.10 To Yuma is a great film noir Western. Glenn Ford's greatest role & Van Heflin's too (& Shane as well......very similar). Richard Jaeckel is also very good, as is Henry Jones (a very underrated character actor......see The Bad Seed).I saw 3.10 as a kid on the big screen and the one image that got to me and separated it from anything else I had seen up until then, was Jones' hanging and that swinging shadow on the wall! Scary stuff at the time. Great suspense. Great twist ending......Ford leaping onto the train! Fantastic theme song! Great stuff all around. Bale & Crowe did well in remake, but just didn't quite get there! Agreed on all counts, Ron. Thanks for your recollections!